cross-section of the human teethThis illustration shows the anatomy of a tooth and gums as well as the supporting structures that surround a tooth. Blood vesselscarry nutrients to the tooth. Bonealveolar bone - forms the tooth socket and provides it with support. 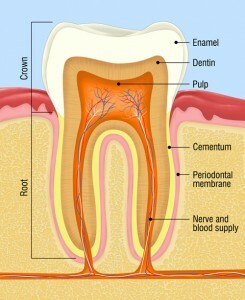 Cementumthe - layer of hard bone-like tissue covering the root of the tooth. Cemento - enamel junctionthe line where the enamel and cementum meet. Dentinthe - hard yellow tissue underlying the enamel and cementum, making up the main bulk of the tooth. Enamelthe - hard, white outer layer of the tooth. Gingivathe - gum tissue surrounding the tooth. Ligamentthe - connective tissue that surrounds the tooth and connects it to bone. Nervesrelay - signals such as pain to and from your brain. Pulplocated - in the center of the tooth, it contains the arteries, veins and nerves.Root canalcanal in the root of the tooth where the nerves and blood vessels travel through.